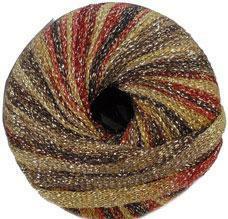 Katia Spark superchunky is a glittering ribbon knitting yarn ideal for evening wear and accessories. Katia Spark knits to a tension of 9st/ 11 rows to 10cm on 10mm needles and has a machine washable (30') blend of 72% nylon and 28% polyester. 60m (66yds) per 50g ball. 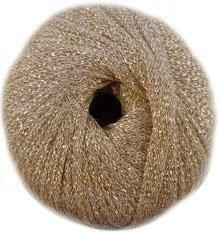 Katia Spark 80 - glittering superchunky ribbon yarn in pale gold. 60m per 50g ball. Katia Spark 82 - glittering superchunky ribbon yarn in shades of gold and brown with copper. 60m per 50g ball. 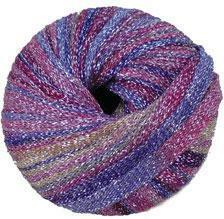 Katia Spark 72 - glittering superchunky ribbon yarn in shades of rose and lilac with sand. 60m per 50g ball. 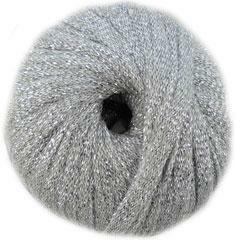 Katia Spark 70 - glittering superchunky ribbon yarn in pale silver. 60m per 50g ball. 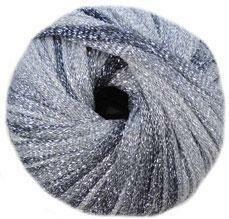 Katia Spark 71 - glittering superchunky ribbon yarn in shades of silver through to grey. 60m per 50g ball.